We are in a week where the world is still shaking from feelings after several extremist attacks in different places across the world. Today it seems more important than ever to remember why the 17th of November is a day to remember and mark. On the 17th of November in 1939, the Czech University was stormed by the Nazis who systematically killed and sent students off to concentration camps. The 17th of November has since been marked internationally as the students’ day. It’s a day for multicultural events and student engagement. This year student organizations in Norway are active on different topics. The Students and Academics International Assistance Fond (SAIH) have the annual conference of the Radiator awards to challenge stereotypes. The Norwegian Student Organization (NSO) have focus on the mental health of students. In ISU Norway we have decided to spread some warm feelings with hugs to whoever crosses us on the streets in Oslo today. The Norwegian youth and student society are among the most engaged in the world. In Norway there are many members in NGOs. They say that every person in Norway on average are a member of 5 NGOs each. It is something we as international students really appreciate to be welcomed into and to be a part of. Engaging in student organizations matter and can change society into what we believe is a better society. The past two years student organizations in Norway united and have been the front speakers against tuition fees and discrimination of international students outside the EU/EEA area. As of today there are no tuition fees for education in Norway. This year the topic for international students in Norway is the Quota scheme. The Quota Scheme program gives an opportunity to study in institutions of higher education for 1100 students who would not have the opportunity otherwise. The students gain experience on how Norway is organized to take home with them. That experience is priceless for the development in their countries, for the individual students and has an important role in the development of youth with international experience. If the possibility of applying for the scholarship is cancelled, the students from developing countries will not be able to afford to study in Norway. We hope that Norway in the future will continue to provide this possibility for our fellow students from developing countries. 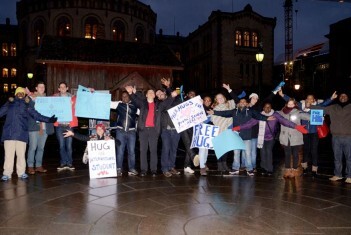 Come around today and get a multicultural and peaceful hug from international students in Norway in Oslo.